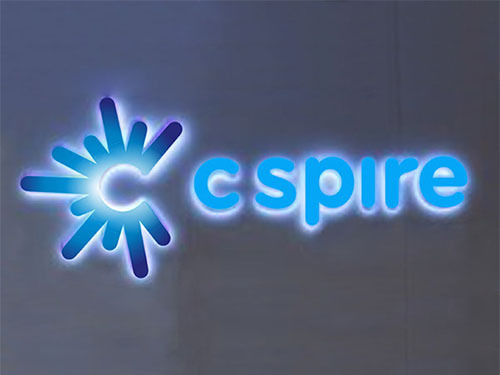 The look of the letters, the colors and the luminosity set our logo apart from all others. Everyone is in agreement about how great the signage looks on our corporate headquarters and retail locations. Also thank you for the assistance and confidentiality that you and your employees have provided for us in the endeavor. You have a very professional team and we enjoyed working with them on this major project. 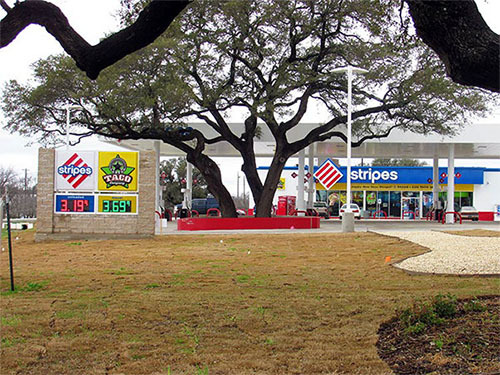 I would like to take a moment to express how pleased Stripes Convenience Stores are in the quality and performance of the LED gas price signs you have exclusively provided for many of our newly constructed and re-modeled stores. In addition, the unmatched customer service and professional manner in which you and your staff respond to our needs is second to none as compared to our experience with other sign manufacturers. We are convinced that our Stripes stores are being supplied with the finest LED pricers available in the market, with the boldest digits and excellence in fabrication and software capabilities. In fact, we have reduced our LED pricer maintenance dramatically. The Arabian Theatre is one of the many beautiful landmarks in downtown Laurel, MS. When we desired to refurbish our historic entry signage to the original concepts, we contacted Headrick Signs & Graphics to work with us. 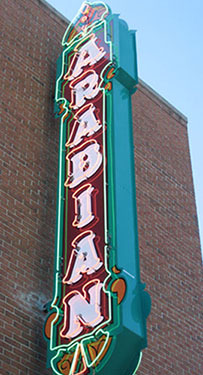 Headrick partnered with us to refurbish the original historic sign, create a new fully updated sign replica and installed it on our building. We also worked with Headrick from conception though the installation of our faux architectural embellishments. The overall goal was for the sections to look like it was part of the original structure. This goal was achieved. Once again, the beautiful Arabian Theatre is an outstanding landmark for the city, beautiful still today. So many patrons continue to enjoy the magnificent structure. We were pleased with our partnership with Headrick. We highly recommend their team to anyone or any business seeking signage or embellishments. We would like to express our thanks and heartfelt gratitude for the Noah's Ark Scene at the entrance to our preschool/ nursery area. 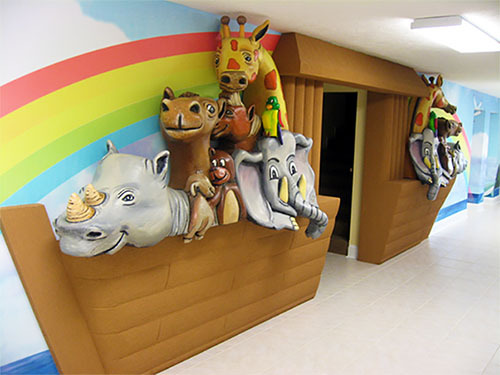 The workmanship and artwork make the story of Noah's Ark come alive to our children in a very wonderful and positive way. Your construction in bringing to life the Biblically based theme of Noah's Ark is truly amazing. The children and adults alike enjoy entering Noah's Ark on a weekly basis and our goal is to see all of our children come to salvation in Jesus. Noah's Ark is a wonderful picture of the salvation that can only be found in Christ. Every visitor who passes by Noah's Ark is amazed and blessed by it. Noah's Ark is truly a great blessing to our preschool/ nursery and to our entire church. When I see them, my heart begins to sing. They are absolutely a work of art in steel. 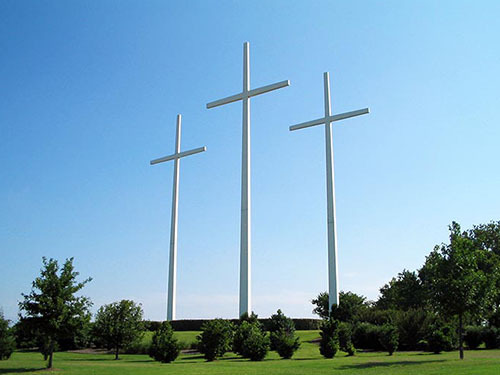 I am amazed at the beauty, the symmetry, the delicate strength of these massive crosses. They are indeed a piece of art. When a wonderful family united with our church, they were asked what inclined them to come. They said immediately -- the crosses. When a girl was led to Christ, she had left a distressful home. She was looking for God. When asked what brought her to Bellevue, she said -- the crosses. As a recent customer of your fine company, we wanted to express our thanks and appreciation for assisting us in fulfilling a dream. 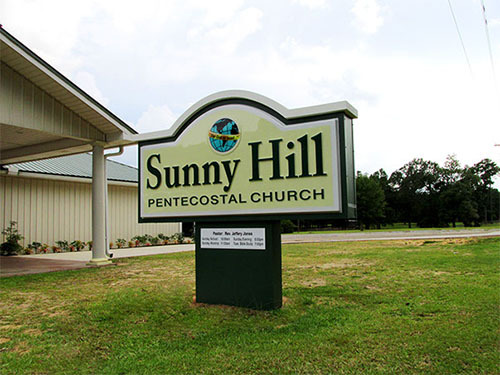 Being a smaller congregation and having been without proper church signage for years, we were moved to tears when our new sign was delivered and installed. We are especially grateful to God for the many blessings bestowed upon us. We could not have been more pleased with the service provided by your company. From the first visit with John Rebry, to the follow-up calls he made after installation, we were impressed with professionalism, expertise, and the customer care extended to us. Everyone in your company made us feel assured while aiming for customer satisfaction. This experience has been a tremendous blessing to our church. Our sign is beautiful. Each night as it lights up the front of our church, we are reminded of our friends at Headrick Signs and Graphics, Inc. and offer thanks to our God for their friendship and making it all a reality. We wanted a school sign that would represent our "Little Legend and Tradition of Braves". 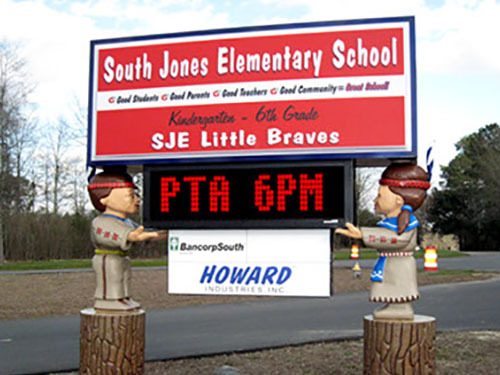 We gave a picture of a little boy Brave and a little Indian girl to design the marquee sign for the school, and also we wanted a title of "South Jones Elementary School...Good Students + Good Parents + Good Teachers + Good Community = Great School...SJE Little Braves. Mr. Loper took care of all the details and he went the extra mile to help sell advertisements to pay for the sign. This three dimensional sign captures the attention of everyone that passes by the school on the corner of Warrior Road and Blue Bird lane. The lights and electronic LED moving message sign let the community know about the great things happening in the school. Mr. Loper also set up training for the office staff to learn how to program the marquee, and the students loved the Indian boy and girl.